idoodlelearning inc., a global education company that prepares students to become 21st century learners, workers, and citizens by bridging the gap between traditional and digital learning, announced today a partnership with Colombia based Ideatech, for the addition of a high altitude balloon component to the 2016 Cubes in Space™ STE[A]M design competition for students. A STE[A]M-based global education program open to students ages 11-18, Cubes in Space provides students a no-cost opportunity to design and compete to launch an experiment into space. Utilizing formal or informal learning environments, students and educators are exposed to engaging content and activities in preparation for the design and development of an experimental payload to be integrated into a small cube (Cube). These Cubes will be launched on a high altitude balloon by Ideatech from a facility in Medellin, Colombia in May 2016. Another flight opportunity will be launched into space via sounding rocket from NASA Wallops Flight Facility on Wallops Island, VA in late June 2016. 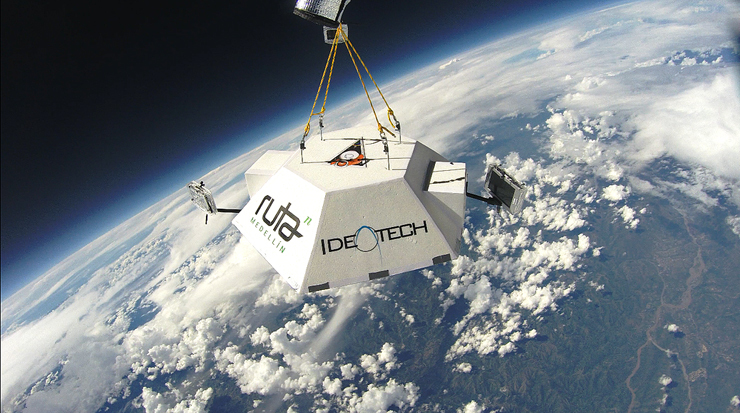 “We are very excited to be working with Ideatech, who are a group of young professionals in Colombia trying to change the science and technology landscape for their country’, said Amber Agee-DeHart, President of idoodlelearning inc., “Ideatech creates innovative near-space balloon-borne platforms to fly scientific and educational experiments, test space technology, and capture images of Earth. It is that innovation, imagination and entrepreneurship that epitomizes what idoodlelearning and Cubes in Space promote around the world.” The addition of a high-altitude balloon launch from South America to the Cubes in Space program not only brings access to space for the students of an emerging market but expands the reach of the competition beyond the 22 countries already involved presently. Cubes in Space offers global design competitions at no cost to students 11-18 years of age to develop STEM-based experiments for launch into space.